MELBOURNE (Reuters) - The president of Kiribati on Thursday said he was disappointed by the Australian government's decision to approve a giant coal mine, as he urged the major exporter of the commodity to take action on climate change ahead of a key summit in Paris. Impoverished, low-lying Pacific islands such as Kiribati, Vanuatu and Tuvalu are among the most vulnerable countries in the world to climate change and a creeping rise in sea levels. 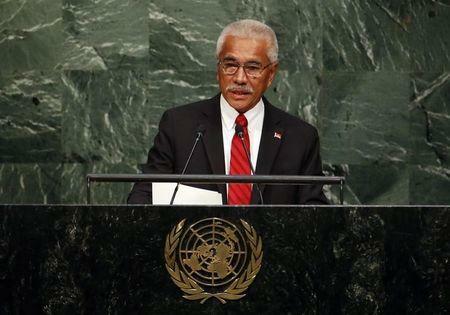 President Anote Tong of Kiribati in August called for a global moratorium on new coal mines to slow global warming. Since then, Australia has pushed out former prime minister Tony Abbott, who said coal was "good for humanity", and replaced him with Malcolm Turnbull, whose government last month cleared the way for the giant mine being developed by India's Adani Enterprises. "I know that the government approved the Carmichael coal mine. It's disappointing," President Tong told a press briefing in Melbourne. The Australian government last month reissued an environmental permit for construction of the mine in the untapped Galilee Basin in northern Australia, which could export more than 2 billion tonnes of coal over its life. But the contentious mine has since faced a fresh legal challenge from conservationists, while prominent Australians, including a former central bank governor, scientists and doctors, took out an ad in a major local paper to also urge world leaders to back the moratorium. "In Paris, there is a great need to come to some agreement. The question is, if it is not a moratorium on new coal mines, then what? There has to be a genuine commitment to transitioning away from fossil fuels," the president said. Almost 200 nations are expected to meet in Paris from Nov. 30 to Dec. 11 to try and agree a global accord to slow climate change.